Chinese New Year is upon us, with businesses closing up for a long holiday and most Chinese families looking forward to a reunion. But of course people still get sick at Spring Festival and the Chinese media has been full of stories praising the heroic and dedicated doctors and nurses who forego the holiday and put duty ahead of family to stay at work. There are stories of doctors working solo for 24 hours to keep up with all the demand during the Spring Festival. From Hubei there is the story of the man bitten by his rabid pet dog who went to the hospital and was hugely relieved to find that the infectious diseases doctor was on duty to give him a rabies injection. 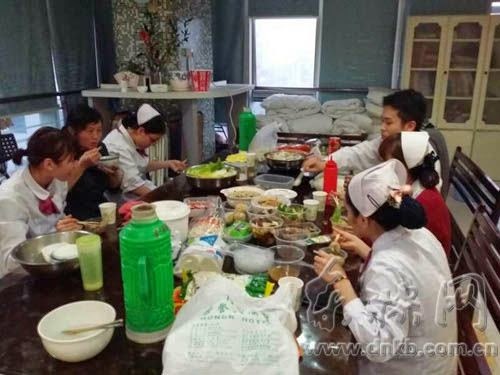 At Fuzhou Hospital on New Years Eve the medical and nursing staff gather together to have the "big family banquet" that they would normally have with their families at home. And there is even a story of the doctor at a Zhejiang leper colony who was urged by his ailing patients to go home and see his family rather than spend New Year on duty at the sanatorium. Not all doctors have been heaped with praise at Chinese New Year, however. In Guangzhou there has been an uproar among the medical community after the city authorities sent anti-corruption teams in to raid hospitals just before Spring Festival. The city disciplinary affairs committee said the inspection teams were looking for evidence of bribes and 'hongbao' (red envelopes) given by patients to doctors. The raids have so far turned up little evidence of bribery, and doctors have been indignant at being suspected of corruption. They objected to having their everyday items such as snacks being documented - and also being questioned in detail about the origin of their possessions - and even for receipts for goods. Doctors said the actions of the inspectors went beyond their powers and the actions should have been a matter for the police. One doctor said a public hospital was not a place where bribes could be openly given or solicited among colleagues - and he was also indignant that many doctors had prepared hongbao or gifts for their families which were assumed by inspectors to be bribes from patients. Chinese New Year is also a peak risk time for influenza in China. In Guangdong it has been reported there have been 53 cases and 13 deaths from H7N9 avian influenza. In neighbouring Hong Kong there has also been a very severe flu season caused by the regular influenza H3N2 strain which has been causing as many as 18 deaths per day in the city. There have been reports of shortages of antivirals such as Tamiflu in Hong Kong, and the flu vaccine this year has been ineffective because the H3N2 strain of flu is a new mutation that is not covered by the vaccine. Of course influenza does not stop at the border, so we can only assume that the flu toll has been equally high in mainland China. Another major infectious disease under the microscope this week is the recent outbreak of measles affecting more than 1200 people in Beijing. Infectious disease specialists in the capital found that most of the cases originated in wholesale clothing markets popular with locals and international visitors - so an MMR vaccination might be a pre-requisite if you are going to the Silk Market. The analysis found that many of the cases occurred in migrant workers who (unlike Beijing residents and tourists) had low levels of measles vaccination. The researchers recommended that outreach services be set up to vaccinate migrant workers in Beijing and "the offer of measles vaccine to workers as they register to live and work in the commodity markets might be a reasonable strategy to prevent future measles outbreaks." In other news this week - the high demand for blood products in China is driving a thriving black market in organised gangs of donors, organised by the so-called "blood heads" who are paid thousands of RMB for supplying blood. In the field of diabetes, some Chinese endocrinologists have been blasted in the pages of the Lancet for writing a review article that recommended the use of expensive new drugs as first line treatment for diabetes. Their critics say the endocrinologists failed to mention the more effective and cheaper drugs such as metformin - and the Chinese doctors also failed to mention their financial conflicts of interest with the Big Pharma makers of the expensive new drugs. And finally, the quality of medical education in China has been questioned in several articles published this week. The Year of the Sheep is a milestone for China's medical educators in that they are now requiring a standard 5+3 medical degree + internship program be implemented nationally. However, some commentators have said that the new system will be no better than the current haphazard postgraduate 'Masters' programs if medical graduates receive insufficient clinical experience and supervision. They also say that the internship scheme should include 'exit examinations' to ensure that trainees have actually acquired the specialist skills they have trained in. Coincidentally this week Shanghai media report that trainee doctors get little experience in anatomy because there is a national shortage of donated cadavers. Chinese culture prohibits citizens from 'donating their bodies to science' as is done in the west. This means that Chinese medical graduates get all their anatomy learning from textbooks and have very little "hands on" experience. This is worrying for students going into specialties such as surgery - as they may never have practiced techniques such as cervical spine surgery before being asked to do the real thing. Not surprising then that a special anatomy cadaver training class at Shanghai's Fudan University was heavily oversubscribed.